“It’s Showtime” the new noontime show for ABS CBN network as a replacement for “Happy Yipee Yehey,”. It is the title given for this show that will compete the biggest and by far noontime show on GMA 7 network, "Eat Bulaga!". Will the new noontime show of ABS CBN's "It's showtime can really pull off and attract new TV viewers? Lets see what will be it's rating this coming first reveal as it marks on calendar this coming February 6, 2012. The "It's Showtime" will be hosted by Vhong Navarro, Anne Curtis, Billy Crawford, Karylle, Kim Atienza, Teddy Corpus, Jugs Jugueta and Vice Ganda. It's the new reformed of “Showtime,” that aired for 2 years where talented Filipinos proved their great talents to be seen them on TV. Also Jhong Hilario, Ryan Bang, and Coleen Garcia will joined hosting the said new noontime show. Watch “It’s Showtime” this February 6, 2012 and you will going to witness the new noontime show for ABS CBN Kapamilya network. 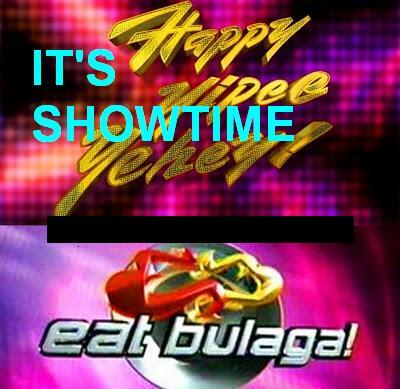 The new noontime show will replace “Happy Yipee Yehey,” which will be farewell its final episode on February 4 2012. “ABS-CBN invites the viewers to continue their unwavering support for Showtime as it moves to noontime, from Monday to Saturday starting February 6.” said Bong Osorio, Head of ABS-CBN Corporate Communications. More strategies, more attractive marketing, more entertainment, more actresses and actors hosted, more and more worked done by ABS CBN to cope up and compete the biggest name of noontime show of GMA's "Eat Bulaga" since Willie Revillame's left on ABS CBN for TV 5 Kapatid network. More power to ABS CBN, and for GMA 7 network, just be prepared for ABS CBN's new noontime show.